Documents obtained by MuckRock enumerate the voting issues present in Georgia’s 2018 midterm elections, which are now the subject of a Congressional investigation. The 2018 midterm and gubernatorial elections saw Georgia’s highest rate of voter turnout in a non-presidential election in recent history, with 57% of registered voters showing up to cast their ballots. But the state was not prepared: despite frequent pollworker and voter complaints about the shortage and malfunctioning of voting machines, hundreds of machines sat unused in warehouses across several Georgia counties. Voters faced long lines, and frantic poll workers scrambled to accommodate the turnout. Allegations have arisen that this lack of preparedness wasn’t just due to lack of foresight but rather intentional acts of voter suppression. Governor Brian Kemp, who was Secretary of State at the time and responsible for election oversight, defeated Democrat Stacey Abrams by a slim margin of 55,000 votes. Chris Harvey, the Elections Director during Kemp’s tenure, has also been serving as the Chief Investigator since 2007. The Chief Investigator’s duties include investigating violations of Georgia’s election laws. In a request for Harvey’s emails from November 6-8, 2018, the Secretary of State’s FOIA Officer claimed that there were no emails responsive to the request. However, files from Gwinnett County included emails from Harvey that fell under the scope of the request. MuckRock is appealing the decision. According to the records, problems in Gwinnett County ranged from only having two felt tip pens at a polling site to voters distrusting paper ballots, which were distributed due to issues with electricity and voting machine cards at several locations. Voters in Gwinnett also faced issues with malfunctioning voting machines. Event logs obtained by MuckRock from Fulton County show complaints from voters and poll workers alike largely focused on a shortage of voting machines and machine malfunctions amidst ever-growing lines. Many reported understaffing, insufficient supplies, and general chaos at voting sites across the state. There were also issues with voters who were purged from the rolls for inactivity, sometimes for as little as going two years without voting in an election. These purges, overseen by then-Secretary of State Kemp’s office, have elicited national uproar for disenfranchising over 300,000 voters, one of the largest purges in U.S. history. After election day in Forsyth County, officials began reevaluating polling locations due to high voter turnout and overcrowded facilities. 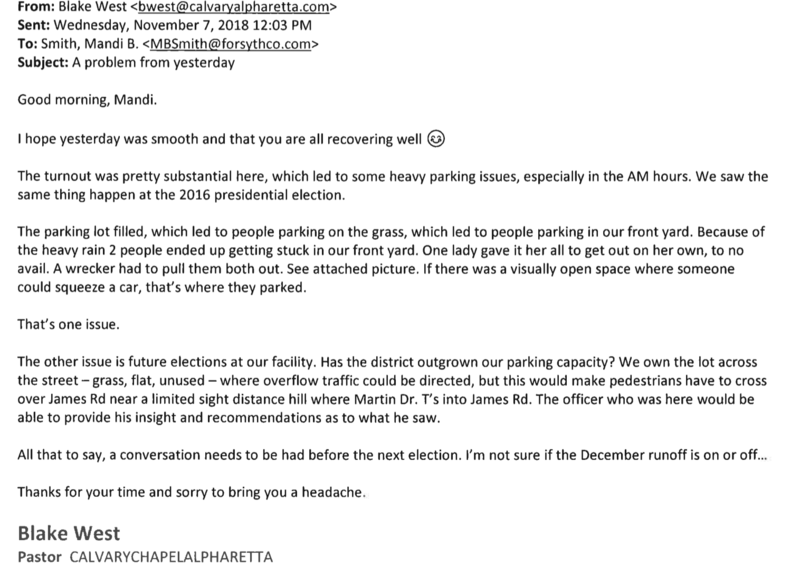 Polling locations were so swamped that parking facilities at one polling location, Calvary Chapel in Alpharetta, were completely full, leading voters to pull their cars into the churchyard. 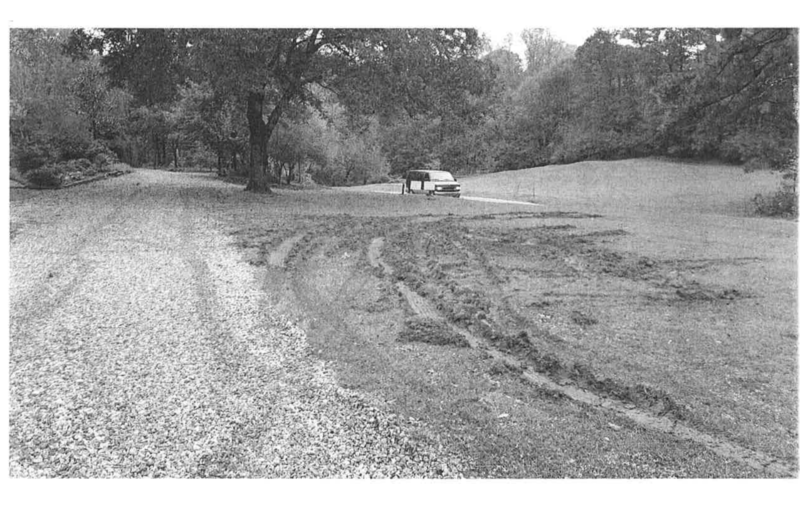 Some voters then got stuck in the muddy grass, leaving tire tracks across the property and eventually requiring the help of a tow truck. Email records and event logs from multiple counties included many general complaints from voters who were shocked at the high turnout and and frustrated at their counties’ handling of it. Additional requests are being filed by MuckRock concerning the 2018 midterm elections, state-by-state. Up next on our list is North Carolina. In the meantime, the full set of complaints from Forsyth and Gwinnett counties have been embedded below.